Model MWS-47-WT-SS allows users to wash forklift batteries on-site, regardless of water source or availability of drains. 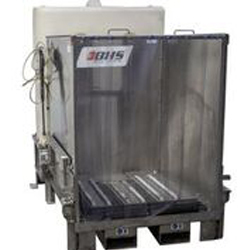 The frame, complete with fork pockets, supports a stainless steel MWS-47-SS Mobile Wash Station and integrated, 120 gallon tanks for both clean and used wash water. The result is a turnkey solution for washing forklift batteries on-site, then hauling away wastewater for EPA-compliant disposal. The clean water tank includes a ball valve with a garden hose adapter that connects with all common power washers, while the wastewater tank features a ball-valve drain. To learn more battery wash equipment from BHS, call the sales team at 1.800.BHS.9500. Optional interface to connect MWS station to WRS (wastewater recycling station) to create turnkey battery washing solution.